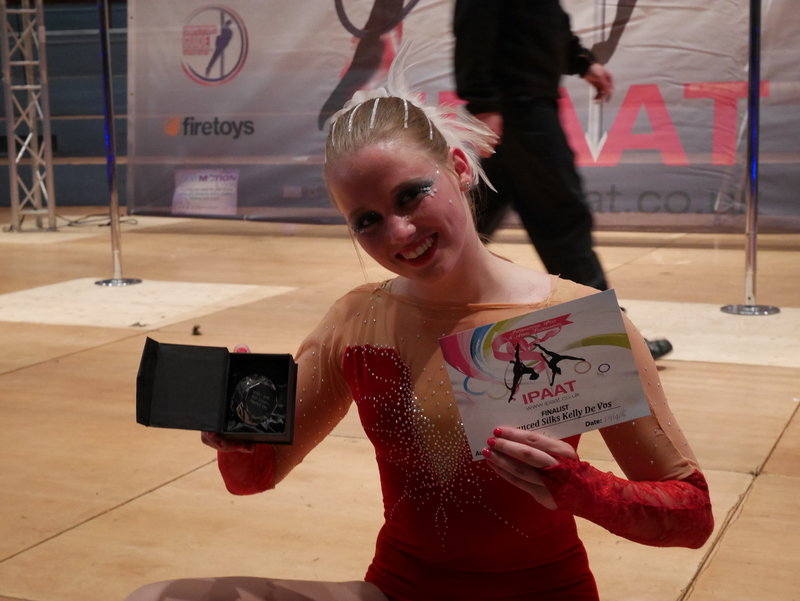 Sunday 19th June I’ve participated the International Pole And Aerial Tournament IPAAT 2016 and it was freaking awesome! As I’m writing I’m still in my car driving back to The Netherlands. My father is driving, so it’s cool, I can write :D.
Saturday June 18, 9:00 am: From Zaandam, The Netherlands it is a four hour drive to Calais, France where the train will depart at 14:20. With a couple delays and a few coffee breaks (come on, I need my coffee), we arrive at 13:40 at the check-in desks, being just in time for several car and body checks. The train departs and we go back in time as it is only 13:50 when arriving at Folkestone, England. Another 3,5 hour is yet to come. With a couple delays around London and a small detour, we arrive at the Hilton Hotel of Nottingham just after eight pm. We go for a diner later at the Coast2Coast restaurant with delicious buffalo chicken tenders in blue cheese sauce which we will eat the next day again. My dad and I driving to England! Suddenly – as I am writing this piece – my car breaks down. We hear a loud sound and look at each other, realizing something is wrong. “Dad, pull over!” We park the car on the side of the highway and wait for the ANWB to help us, but more about that later ;). So, where was I? Nottingham! It’s a beautiful city as far as I’ve seen and has a very nice hotel. Saturday evening after some beers we go to bed and I have to admit I was a little nervous for what will happen the day after. Sunday morning, June 19, status: very nervous. Not able to eat properly. What costume should I wear? Which drop will I do? Did I practice enough? What if it goes wrong? What if I get stuck? What if they don’t like me? Woaoaaahhhh. Thoughts running through my mind. My father and I walk in the Albert Hall and see all those amazing and enthusiast people. It’s really amazing to see how sports can bring all kinds of people together. It was really nice my father was there as well. I like to go on adventures on my own, but I love to go on adventures with my dad! He’s just really amazing for going with me =]. Eventually we met a lot of wonderful people, we meet Emma of Emma’s Pole Dancing who – I believe – came up with IPAAT originally. She’s an inspiration to a lot of poledancers and earialists and I could see why! I meet my competitors and their routines are awesome! I’m getting nervous.. I did not practice as much as I wanted. Maybe I should’ve practiced more. It should be perfect. Damnit! Why is everyone else soooo good? I see a lot of awesome tricks I haven’t seen much before. I also see some climbing techniques which are nice to look at and I think my technique is just sloppy and not entertaining at all. I do something as a warm-up and climb a little to see if my drops will come out fine. I get some nice reactions, which I did not expect at all. We all chat a little and the silks are changed for hoop, which I don’t compete in today. Time to go back to the hotel and eat something. About an hour later we get back at the Albert Hall and there are more people now. I’m going to the dressers room and meet a lot of beautiful people. It’s hard to see who is competing against who, with all those categories and levels. Eventually you’ll end up by chatting most of the time to the ones you’re competing to. It was really nice to meet all of hem! All categories are done, except for one: Aerial Silks Advanced. From the eight people competing I would be the very last one to show my routine. Trying not to watch the other performers makes me really nervous. Breathe in – breathe out. EXCITEMENT. Breathe in – breathe out. There I go. The girl who was presenting the show talks about me and gives me a look that says “wow, good job!”, but because I was at the wrong side of the sound equipment I could not hear what she was actually saying. Probably it was my biography, talking about my Engineering study at the TU Delft or something like that. Maybe it was only because I was from The Netherlands. Till today, I still have no clue at all. I climb, wrap myself, shake a little, breathe in, breathe out again and then I give my thumbs up for starting the music. BAM. The silks fall down. BAM BAM. Wiggle the silks, make them move. BAM BAM. Thereee goes Kelly! Slide a couple of meters down and the audience gasps. It’s the way it should be guys, relax ;)! EXACTLY the reaction I was hoping for. The drop ends with a single spin. I take a sharp look at the audience and the judges and continue to the beautiful violin part of the music to show my elegance as well. I continue my routine and climb up again, trying to be elegant. Suddenly this thing happened – where I was scared of it would happen. The silks are wrapped into one another and I’m not able to spread them as fast as I wanted. The audience could see this and they did. The judges see it. But I’m not giving up, I’m the boss and you shall spread NOW you stupid – oh sorry not stupid – silks! And there they go, I’m still in time for the next move in my routine, because I planned on it. I continue my routine, but not as beautiful as I wanted it to be. After all, I was proud. AWARDS! Everyone is excited and happy and amazed by all the talented people. We get on stage as the last category, walking weirdly towards the stage with our finale ticket in front of us, dragging us towards the stage. It creates a couple of laughs :P. The first prize was the prize for best costume. We actually all agreed that Hayley would win this category with her LED light dress and make-up and everything that made her look like Elsa from Frozen. It was really cool! The name was called of the person who won, but I didn’t pay attention to that, cuz I already assumed it was Hayley. So I looked at her very happy, clapping and yelling GO HAYLEY! When suddenly nobody was walking. Then I realized I did not listen to the name that was called. I tried to remember what was said, and it was my name. MY NAME. So I’m like, “are you sure?”. Where the presenter laughs at me (of course) and so did almost everyone. When she hands over the price I’m again not sure if she really meant to give it to me, so I ask again “are you sure?”. She laughed and said “YES”, then the picture was made. I became fourth on the overall performance right after the three guys who participated. It was very cool to have the only three guys that were performing this whole day won the advanced silks category. Excited as I still was, I thank everyone for giving me this price for best costume. I really did not expect this and it is a really nice compliment since I made this suit by myself :). I talked to Rebecca Plume of the judges, to whom I competed in October 2015 at the UK Nationals. It was nice to catch up :). Or course the day after we had to catch the car train to France again. After a little celebration in the hotel and restaurant my father and I go to sleep and get up early. We have some awesome breakfast and hit the road. Unfortunately the 1,5 hours we took extra to get in time were not enough. After a lot of traffic jams and accidents around London we arrive not even ten minutes after the closure of the gates. But, the train was delayed and we had to go to the terminal. Lucky for us we could use our old ticket even though we checked in too late. In the terminal we get some coffee, finally! After all the hurry on the road without foods and drinks we finally had time to get some of that. At the local Starbucks we wait for announcements, but every announcement gives worse information. We have no clue how long we are going to be stuck at England, so I decide to cancel my Aerial Hoop class for that night and text my friends that I might not be able to join the exam meeting the day after. Something in the tunnel happened and we have no clue of what could have happened. Is it a terrorism attack? Noooo, they would tell us, right? After hours we get more information and eventually there only was an unannounced inspection and we were able to continue our journey with a couple of hours delay. Driving goes well and suddenly I realize that I have to study again. I brought my laptop and think I should prepare for my exam the day after. My father and I switch seats and in The Netherlands I finally open my laptop and check out the bunker we made in some program and read our report over and over again. Suddenly I hear a sound, a bit familiar. My father likes to annoy people by driving on those white stripes on the road. You can feel that when you’re in the car and you can hear that. The sound we heard was similar to the actual sound and I immediately look at my father. I realize he’s looking at me like “I’m not doing this, am I?” and I shout “PULL OVER”. My exhaust valve broke on the front side of my car. Like WHAT, the car has been checked not even two weeks earlier! This should not be true. I’m texting my mates again that I’m not sure if I could join the exam meeting tomorrow. They can not understand the bad luck I’m having this day and I’m just laughing. My father calls the ANWB and they take away my car. Thinking of the fact we needed only fifteen more minutes to arrive at my parent’s house. It is going to be a looooong night..
Me in the front, two guys from the ANWB and my father in the back! The guys were very funny and we were so happy they helped us. They wired it so I could drive home. Sounding like a sports car I drive home through all the small streets in the middle of the night. My mom could almost not believe what happened and realized I had to go home for my exam meeting that morning (yeah it was already after midnight). My father did not own a car anymore, only an awesome motorcycle. But I needed my suitcase and stuff that morning. Motorcycle was no option to get me back at Delft. Luckily my mother owns a car and my dad could drive me home, where he had to drive back to Zaandam again since my mother needed the car again for going to work. My father also had an important meeting that morning. As tired and broken that we were, we both rocked our meetings and were happy with that. Finally some time to rest a little bit and talk about the amazing IPAAT weekend we had! Lots of love and hope to see you next year at IPAAT 2017 ;)!